Ahh February… a time of intense cold and fiery passion. It always feels like spring is almost here, like it’s ready to pop up from behind a bush with an axe screaming “Heeeeeere’s allergies!”. Unfortunately, it isn’t and it’s frightfully cold. At least you have Valentine’s Day to look forward to- spending the nice romantic day with you significant other, snuggling, eating gratuitous amounts of chocolate. Hopefully during your Valentine’s Day celebrations you can make time for some climbing. I love it when couple go climbing together, because climbing by nature is a partner-based activity. You’re trusting your partner with your life and taking their advice on those tricky moves. You’re communicating your needs effectively, whether it be “extra slack!” or “take!” or “oh god I’m falling oh god!” (that’s me in case you hadn’t guessed). When one partner successfully climbs a route, there’s a feeling of shared success. To me, it’s so pure and it really makes me happy to see it when I’m out climbing. I see so many couples come into the gym and work on new routes or problems, and frankly, it inspires me. That’s why this blog post is dedicated to all you adorable couples out there that climb together so much that you already know what the other one is thinking before they even have to say it. The thing is, climbing with a new partner is a journey into the unknown. Are they going to high clip every draw? Do they go slow and steady or do they fly up the wall? Do they like to push themselves on new challenging routes or do they enjoy staying in their skill range and cruising through? How confident in their abilities are they, and how realistic is that confidence? Being that I work in a climbing gym, I’ve climbed with a lot of new partners. I only have a couple static partners that I climb with frequently. Hopping on a challenging new lead climb (whether I’m belaying or climbing) can be daunting simply because I don’t know the person and their climbing quirks. I’ve come up with a loose checklist that hopefully can help new partners become more comfortable with each other! Communication is important in any relationship, and a climber-belayer relationship is no different. Before I climb for the first time with someone, I always ask that they be overly vocal about their climbing situation. If they think they might fall, or are getting pumped, or are high clipping, I want to get all the information. 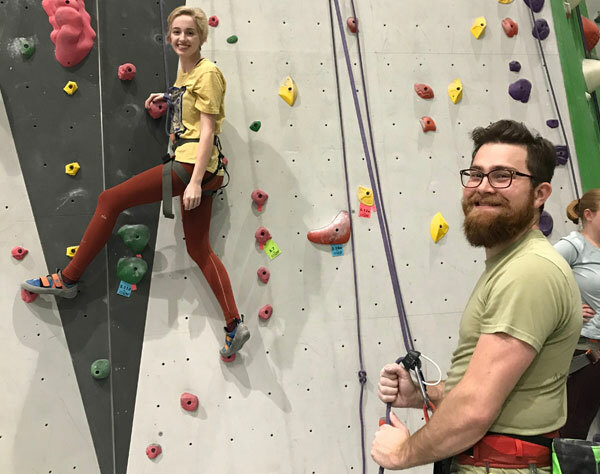 After a few rounds of climbing and belaying its easy to get a feel for the partner and you might not need as much stringent communication as before. Courtesy Slack is a magical and wonderful thing. When your climber finishes their climb and finally touches down on the ground, be sure to give them extra slack so they don’t feel like a giant is grabbing their groin and heaving upward. Male, female, young, old, toprope, lead, mage, or warrior- everyone loves not having groin discomfort. F is for friends who do stuff together U is for U and Me N is for “N”ewhere, “N”etime at all (down here in the deep blue sea) The single most important thing I can say when climbing with a new partner is this- HAVE FUN. That’s why you climb, right? When climbing with a new partner, don’t worry about being better than anyone, or take yourself too seriously. Just have fun! Inspire your partner, cheer them on. Celebrate their triumphs and let them know they still did a good job when they try their hardest but don’t quite succeed. So there it is, my secret master list of what I have found to be successful behaviors when climbing with a new partner. Remember, you do this sport for fun. It’s a great workout both physically and mentally, and is a great way to bond with other people. If you are in the gym and see someone climbing alone, go ahead and offer them a catch. By engaging someone who may be too nervous to approach you, you can stoke someone’s interest in the sport, and could make a great new friend in the process. And when you start climbing together, remember this list. Happy climbing! Kevin Flint standing in the South Clear section of the Obed Wild & Scenic River area on a 17-degree day in January. Photo courtesy of Kevin Flint and taken by Katie Meyer. Picture it, it’s 17-degrees in The Obed Wild & Scenic River Area in January. The rock is cold and ice has formed on many of the area’s popular routes. To most people, this sounds like a nightmare. But, it doesn’t have to be! After all, you don’t sweat as much, your hands stay dryer and stick to the rock better, and there are only a few people (if any) at the crag! Tommy Caldwell and Kevin Jorgeson chose to climb "The Dawn Wall" on Yosemite’s El Capitan in January for some of these same reasons! Here are a few tips to climb in the cold. Wait what? Why bring two of your warmest coats but only wear one? When you are on the ground, you need a heavy coat to stay warm and keep your muscles loose. But, when you climb, you don’t need a heavy coat. You take it off, climb, come back down, look for your coat, and notice it's not where you left it. Your jacket is now on someone else trying not to freeze! Getting it off them is no easy task. Trust me, temporary jacket theft is real at any crag in the cold! For me, I bring a super warm hooded 800-fill goose down Eddie Bauer BC Downlight Stormdown jacket that is waterproof and breathable. I also bring a hooded 800-fill Mountain Hardwear Super/DS StretchDown jacket that is wind and water resistant. With the kind of warmth these jackets offer, I temporarily lose at least one of these every time I climb! It’s inevitable! Hot Hands are essential to keep hands warm! Picture by Kevin Flint. Hot Hands can be your best friend on a cold climbing day! Put two in your chalk bag. When you are climbing and find a place to rest, put both of your hands in the chalk bag to keep your hards warm. You get the benefit of having warm chalk to help sustain warmth in your exposed hands during your climb! Also keep hand warmers in all your jackets and gloves, including the jacket you climb with. With heavier fill coats, the pockets will stay very warm and keep your hands very warm between climbs. One more thing to remember is bring extra Hot Hands. Just like the tip above, Hot Hand theft is to be expected! Put Hot Hands in your chalk bag to keep your hands warm. When you rest, put both hands in the bag. Photo by Katie Meyer. Every time I come to a crux on a super cold day, I stop, put both hands in the warm chalk bag and get more circulation and feeling back in my hands. Even if I don’t need a break and I’m not pumped, there is nothing worst than going through a crux and realizing you no longer have adequate feeling in your hands! You don’t know if you have a solid grip or not and that plays with your mind. If you have climbed more than a few times, you already realize climbing is more of a mental game than anything else! As I mentioned above, climbing with cold hands becomes a danger. To prevent that, have warm gloves with Hot Hands in them! I typically use my Dakine ski gloves that are windproof, waterproof, and very warm. Thicker gloves are hard to belay with, so, I bring a pair of belay gloves. I also put Hot Hands inside the gloves and on the back of my hands. Take turns belaying in the cold. Belaying will force you to be stationary. Photo by Katie Meyer. It’s easy to keep your body warm when climbing. On the ground, it’s easy to walk around and stay warm enough. When belaying, you are stationary and can’t use thick gloves. Climbers stop more during the winter to warm their hands and that prolongs a belayer being in a stationary position for longer periods of time. Belaying more than once is unfair to that person. If you are in the Obed, the warm sunshine in South Clear feels drastically different than Lilly Bluff or the Lilly Bouldering Field. They might as well feel worlds apart! The sun will warm you and the rock to a manageable level once the sun has been out long enough. The more southern facing and exposed rock you find, the happier you will be! Trust me, the bottom of the route Spawn in the Obed and shadow side of aretes in Joshua Tree National Park are very different than the exposed top of Spawn and the sunny side of an arete in J-Tree! Proper clothing that is a must when climbing in the cold. Photo by Kevin Flint. It can be hard to find sun exposed rock and avoid cold wind at the same time. You need warm, breathable, and windproof clothing. But, don’t over do it! Heavy coats and heavy fill puffy jackets can be too much. For me, I found the Salewa Ortles Hybrid 2 hooded jacket to be perfect! It has medium fill on the front, back, shoulders, and hood, but not on the sides or arms. Where there isn’t fill, it offers a wind and water resistant material that will keep you comfortable and dry. It is also perfect for ice climbing and has with a banded end to the sleeve to prevent ice from falling inside your jacket. It also has a form-fitting insulated hoody to keep cold wind off my head. I also use one of my signature Arc'teryx beanies under the hood. There are other variations of clothing I see used. Most notable is a puffy vest surrounded with a windproof rain jacket. Mountain Hardwear and Patagonia sell nice climbing jackets. One other thing to consider is how long you will be on a climb. If you are on a multi-pitch big wall climb in the sun, you will need less fill to keep you warm and would overheat easier if you have too much fill in a jacket. Wear your jacket inside your harness. Photo by Katie Meyer. It’s tempting to wear a jacket on the outside of a harness. That will only get in your way and make it hard to belay. Plus, having your jacket tucked in will keep a lot of cold air out when you make more dynamic moves. Wear layers of clothing so you can regulate your temperature while climbing, as well as the hike in. Pace yourself on the hike in to avoid sweating and moisture. Climb at a steady pace to avid sweating from over exertion! It’s tempting to take your shoes off, get back into warm wool socks and hiking boots. But, if your climbing shoes have any moisture at all, the next time you climb you will stick your feet into a hard and frozen climbing shoe with ice on the inside! Then, you will climb with feet that feel like popsicles! This tip comes from personal experience! If you have very aggressive shoes like La Sportiva Solutions or Evolv Oracles and are forced to take them off, I would recommend putting something warm over your shoes to keep the moisture on the inside from freezing. KEEP MOVING WHEN NOT CLIMBING OR BELAYING. DON’T SIT ON COLD ROCK! Don’t sit on a rock and rest once you complete a climb. You need to keep moving and stay warm. You will get enough stationary rest when it’s time for you to belay! As I mentioned before, the hardest job on a cold day of rock climbing is on the belayer. You will rest more to keep your hands warm. So, don’t waste time trying to figure out a sequence of moves when you are on the wall, find the sequence on the ground so your belayer can be walking around to keep warm! One danger of being active in the cold is the inability to recognize dehydration as easily. Plus, with the heat-holding technology in many of today’s thermoses, it’s ease to carry hot drinks! You can also bring an MSR PocketRocket or JetBoil stove to heat water for tea, coffee, or hot chocolate to help warm you! I often bring small Keurig K-cups of dark hot chocolate for everyone. You will also become the best friend of every person there and you might actually get your warm jacket back! Our bodies burn more calories to generate warmth on cold days. You need more carbs to use as energy to sustain a long day of climbing. I’ve seen plenty of strong climbers loose energy on cold days by not eating enough. “Pale Face” becomes extremely icy when temperatures drop below freezing. Photo by Kevin Flint. One some routes, ice is easy to see. For example, Pale Face, Backlash, and Comic Relief Direct in the Obed are often completely covered in ice when temperatures drop below freezing. The danger comes from ice you don’t easily see. Have you ever climbed a route in the summer and found a secret pocket of water you didn’t expect? Have you stuck your hand in a crack to find it wet? That pocket and crack will now be ice and you will fail to get a grip. Routes in the Obed that stay wet with pockets of water, like Super Ego and Fat Lady Sings, also hold a lot of ice that is hard to see. The route Christine has a few pockets of water and typically has a small stream of ice on it. Before stepping into or grabbing a pocket, check to see if it is filled with ice! DON’T CLIMB OR HIKE UNDER ICICLES! Icicles form on “Comic Relief Direct” in the Obed Wild & Scenic River Area. Photo by Kevin Flint. If you enter a crag in the early morning, you might fail to see the danger of some of the icicles. As the sun warms the rocks, the previously stable and frozen icicles become very unstable falling objects. You go from climber to a dart board! Forget the 17-degree suffer fest and climb at Onsight Rock Gym where it’s always warm! Conquering fear is hard to overcome. People handle fear in many different ways. When I first started climbing, I had a million things running through my head. I would get to the top and start to look down, and all I can think of is how high I was. I was afraid to come down. A climber once told me that to get over your fears you have to conquer them. Once I got to the top, I knew that I needed to overcome my fears. When climbing, you should make mini goals first, before making a huge goal. I coach little kids and I tell them to make mini goals and take it one step at a time. It always makes them feel more comfortable with heights knowing that they don’t need to go all the way to the top the first time around. You might face many obstacles when climbing. You may not be able to get to the top of a route, or you didn’t train hard enough, or you are afraid to come down. When I first went outdoor climbing, I was terrified that I was going to break something. After doing a couple of routes outside, I felt more comfortable with climbing. It definitely wasn’t an easy thing to do. You have to trust your belayer. You also need to trust yourself that you will get to the next hold. Trust is a very important factor when you are climbing, Trusting someone and your gear will help you conquer certain fears if you have any. Trusting that you can get to your next hold without falling or without saying “take” is something that comes over time.Training really hard will help with that. Knowing that you trained hard enough to get to your next hold is very satisfying.